Were they enough to justify all the bad things that happened in 2017 . . . I’m not sure. The only way to come to a conclusion is to go through them all. Here are the moments I completely forgot to write about in 2017. One of my favorite new friendships of the past year was the one I cultivated with Rabbit’s Moon Tea Arts purveyor and Speakteasy Underground host Steve Odell. While I don’t quite fit in with his merry band of tea folks, I do attend the Underground occasionally—if only to be a fly on the proverbial wall. That and he sometimes had some tea surprises that even blew away my “weird tea” palatial paradigm. One night in the middle of spring, he gathered a few of us together for a particularly unusual experience. On a trip to Canada he picked up some Liu An, a heicha I was a fan of. But this batch was special. Special, how? It was over a century old! 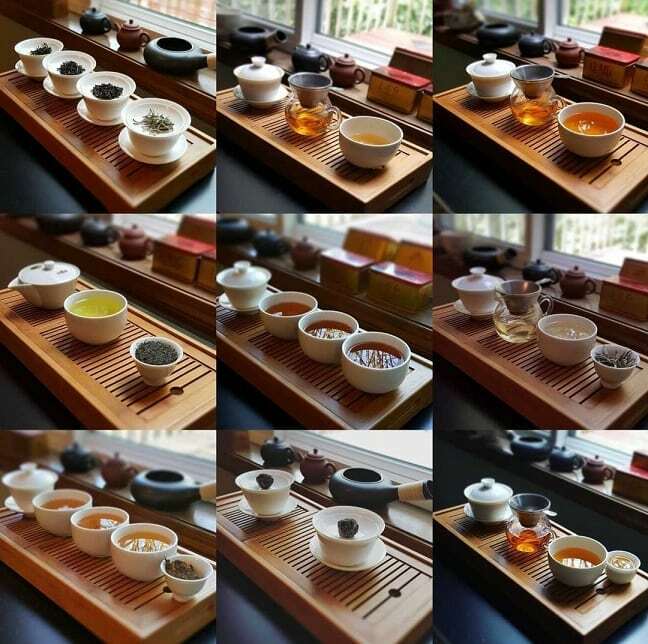 To further enhance the experience, Steve served the tea in cups that dated back to the Ming dynasty. That and he put on an LP that further added to the ambience. The album? “Ancient Leaves” by Michael Stearns. When all of the attendees, including myself, took our first sips . . . something hit us. Everyone reeled their heads back, and shook off “something” from their shoulders. Fear, maybe? Worldly issues? I dunno. Me? I felt like I tasted my childhood from a previous life. 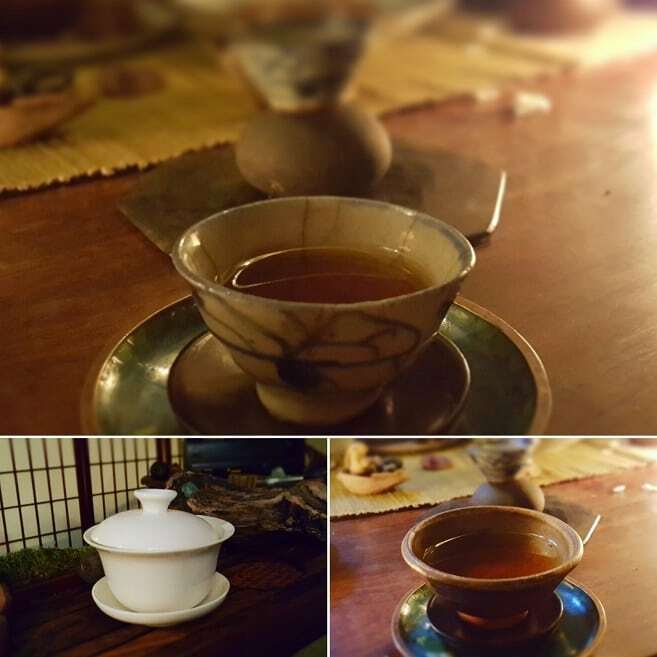 Easily the most unique tea experience of my life. This event had been in the planning stages for years. I think the website was purchased as early as 2012. I even wrote the first blog for it. Plans and planners changed with the wind until it finally landed in the lap of the industrious Jen Brenner. Over the course of months, she put together a planning team, stayed in touch with various vendors and tea groups, determined details and minutia with all those disparate groups, and somehow pulled it all off. I stayed as far away as I could from the planning stages, only ducking my head in from the periphery if there was something to report. When the day of the event finally arrived, I’ll confess, I was a little nervous for the planning team. But then I saw the line. Only Star Wars movies had lines that surpassed the one for this fledgling tea festival. The planning team hoped for at least a thousand attendees. They planned for 1,500, just in case. The event packed in more than 2,500. Can’t wait for the mad[hatter]ness again next year. The return of a certain British girl to my fair city marked one of the few bright spots in my life this summer. She even came along as my wingwoman to the Portland Tea Festival. 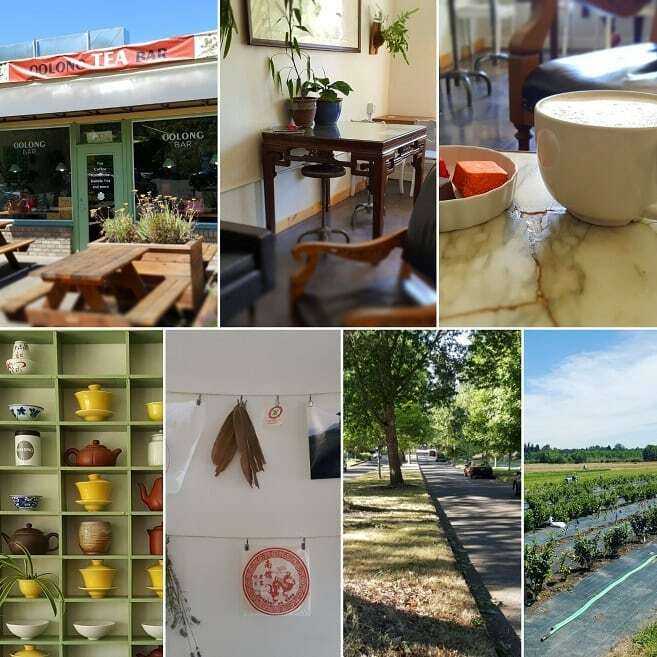 During one random conversation, I threw out the option of driving to Eugene to visit a new teashop. Tea vendor friend Josh “J-TEA” Chamberlain had opened up a second location called Oolong Bar, and I had failed to find an excuse to make the jaunt . . . until then. The British girl gave an enthusiastic “YES!” to that prospect, and one short week later, we were on the road to Eugene. On the way down, we even made a pit stop at Minto Island Growers (the site of Oregon’s only commercial tea garden) for a quick bite to eat at their market stand. They had pizza, and we inhaled it. Then it was back on the road. Oolong Bar is equal parts trendy latte bar, college hangout, and pure tea geek bliss. Somehow, someway, Josh managed to create a space that reveled in the best parts of tea geekery while completely sidestepping snobbery. That and the place was just so darned cozy! We drank our tea lattes and scarfed down truffles, all the while just shooting the breeze. Afterwards, we took a walk around the U of O campus, strolled down some of the side streets, grabbed happy hour at a local eatery, and shared laughter the entire way. It was all . . . perfect. If 2017 had one day that could’ve lasted forever, with nary a complaint from me, it was that day. I was dreading this arrival. Somehow, someway I agreed to be the host and Portland tea tour guide for the Devotea Clan. That isn’t to say I wasn’t looking forward to their visit, I was! Oh, sweet tea gods, I was! But I wanted everything to go smoothly. That and I wanted everyone to be entertained. It was and then some. I took them to every tea hot spot I knew of. We ate dinner at fine delicatessens, and dive-y mom-‘n-pop restaurants. 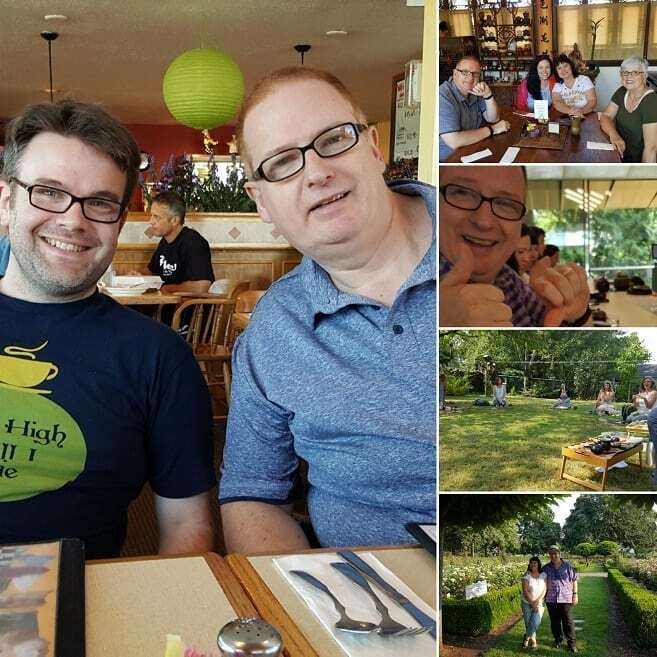 We visited some of my local tea friends, and rendezvoused with ones we already knew. There’s tea drunk, and then there are tea benders. That was a tea bender . . . and it lasted for four days! Don’t believe me? Read Robert’s account of the visit. At the end of September, I flew to Wyoming to help my mother make the drive back to Portland. She loathed making that long of a road trip solo, and I enjoyed making the jaunt out that way. And, frankly, that was the closest thing I had to a vacation all year. Before we made the cross-state trek, Mum agreed to acquiesce to my one request. 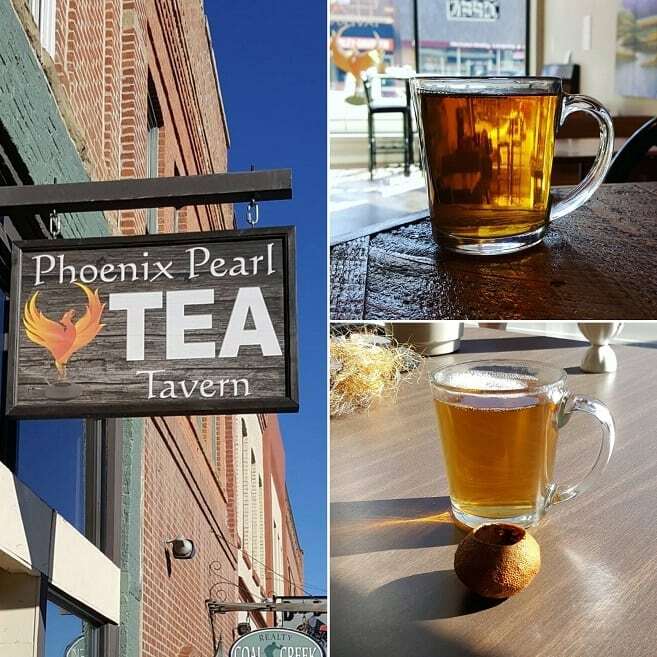 We absolutely had to stop by the Family Robson’s new tea tavern—The Phoenix Pearl. Not only did I want to see Gary and Gwen again, but I also wanted to partake of some of the weird teas they had in their stash. Their palates were equally as exploratory as mine. The morning we arrived, they had actually closed the shop to continue some remodeling. Luckily, my “blogger card” worked well enough for them to entertain my mother and I for an hour or two. Gary and Gwen served me up a Korean sejak-grade Hwang Cha, and I followed that up with a black tea from Myanmar . . . that’d been aged in an orange! We talked tea shop for an indeterminate period of time before Mum signaled that it was time to hit the road. They’re running a quality op out there in Red Lodge, MT. Can’t wait to mosey back into that tavern again. All I need is a belt buckle. Originally, Mum and I planned to make the trip to Portland, and then I had the gumption to take a train the next day to Seattle. The reason? 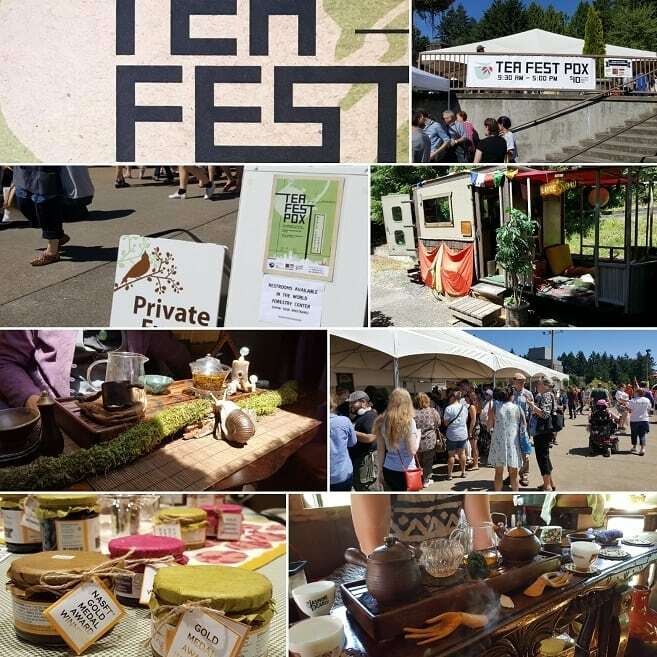 The Northwest Tea Festival, of course! A week or so before we made the road trip, I finally came to my senses and suggested, “Why don’t you just drop me off in Seattle”, since it was on the way to Portland. Mum agreed, and once I was situated in a hotel, she continued on down to Portland, whereas I spent the next three days . . . well . . . blissfully soaked in all the tea. Even more so than usual. For you see, up until that week, I hadn’t had a spot of tea in well over a month. I didn’t hop back on the tea trolley until the Montana stop. 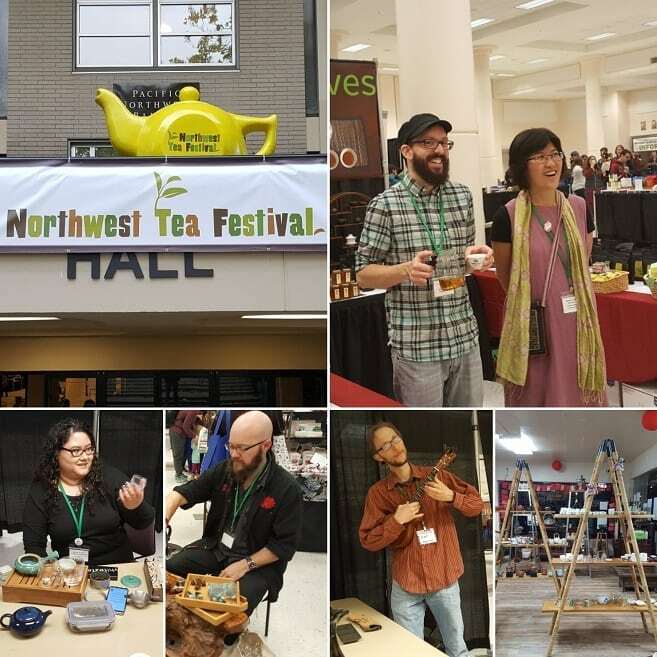 Northwest Tea Festival was bound to be an endurance test of sorts. I attended the festival for both days, went to as many booths as I could, and to some more than once, attended several tastings, and even somehow managed sit on a panel about tea blogging. I survived, obviously. 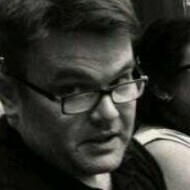 And I had the glazed-over expression to prove it. This last November, I decided to try my luck at NaNoWriMo again. I’ve written about that pointless writer-y endurance test before. The goal? To write a 50,000-word novel in a month, throughout November. This time? I planned to do things a little differently. First off, I decided to schedule my writing time better. Second, I came up with a novel “plan” (of sorts) before starting. And third, I had the perfect tea for evening writing. When I was at the Northwest Tea Festival, my first purchase occurred at the Crimson Lotus Tea booth. On the first day. 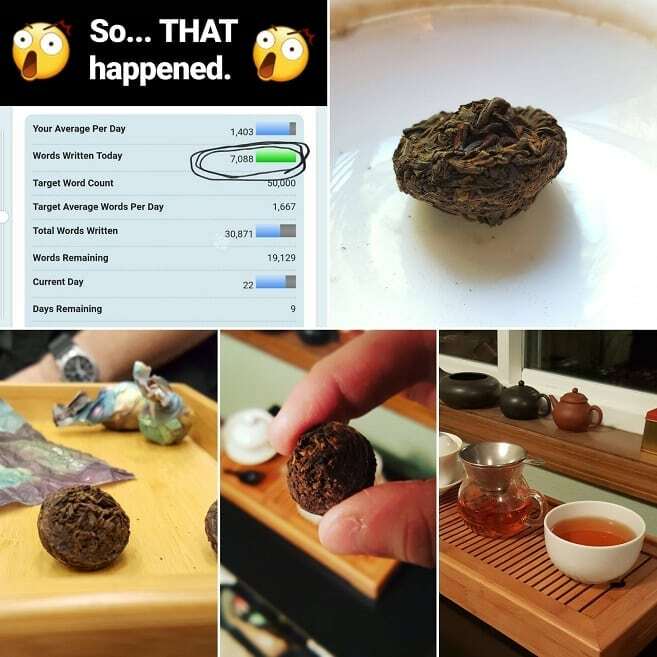 Glen happened to be serving up a pressed Nan Nuo shou puerh, and it was shaped like a tiny mushroom. On first sip, I fell in love with it, and promptly bought twelve shrooms for future hankerings. Aside from the century-old Liu An I had in the spring, this tea was my favorite of 2017. And in the month of November, it got me through many writing binges. Did I make the word count? No. The furthest I got was 34,000 words—27,000 of which were the rough draft itself, and 7,000 were from a day-long outline I surged through. Toward the end, I lost complete interest in my grasp of the idea, but on the plus side, it was the most I’d written on a single story. Ever! From that point of view, it was a success. I was so busy dwelling on the bad stuff; I failed to relish the good. A cheesy Facebook quiz even said as much. Seriously, those things are eerily accurate sometimes. On another social media front, a collage of my most-liked Instagram photos showed a certain amount of . . . um . . .
. . . consistency to my tea photography. I took it as a sign that, maybe, I needed to occasionally change up my point of view. 2017 may have been a less-than-stellar year, but in spite of that, I somehow made the most of it. I just forgot to remind myself. In future years, I’ll try to remember that simple suggestion—be they good or bad . 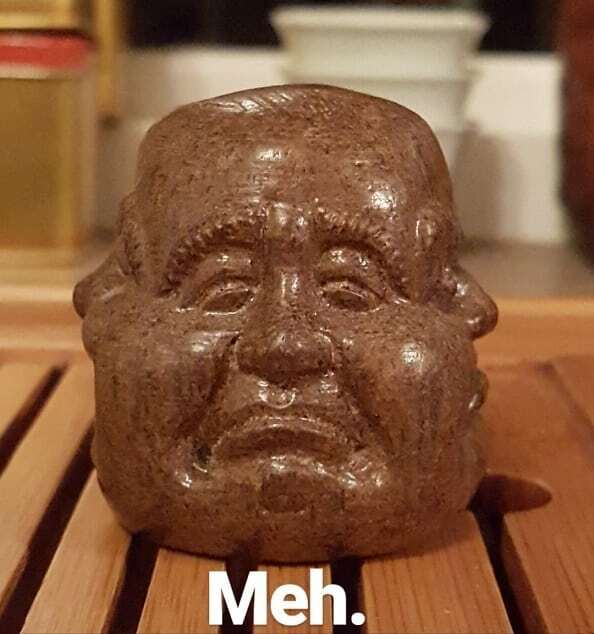 . . or “meh”. Seems like some very interesting experiences were had and some good memories! Caring on! Those were really good times. And don’t blame yourself, we tend to focus on either what happened the last during the year or on one big things. Let’s give 2018 some time to look back at 2017 (that seems to like a really interesting year and not only because you toured The Devotea himself). 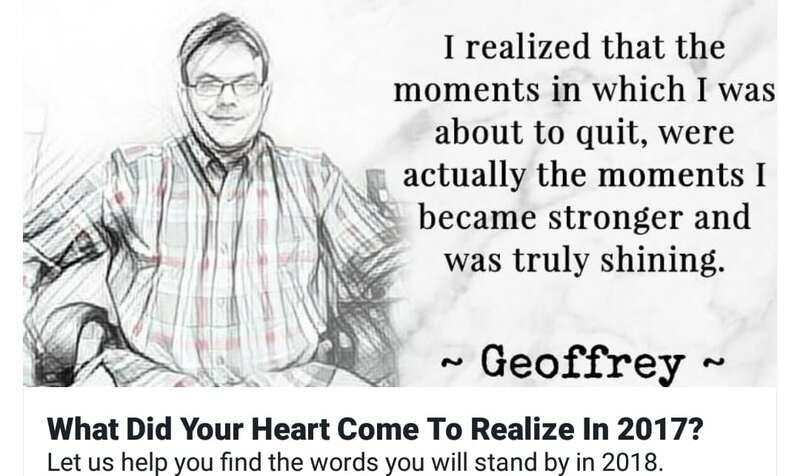 Happy New Year, Geoff. Sounds like 2017 was better than 2016 was for you, and for that, I’m glad. May many more fascinating teas and kooky tea moments come to you in 2018! The mushroom shou from CLT is delicious. I bought the sample of 15, and might be a repeat customer.